One of the big size bird species that adds up to the rich Indonesian fauna diversity is a hornbill. In addition to the big body size, a hornbill also has a large, long, but light size beak. The flapping wings sound loud and also make a distinctive sound. Some species have a perceptible casque with bright colours. There are 62 species of hornbills spread across Africa, tropical Asia, Indonesia and Papua New Guinea. Especially in Indonesia, there are 13 species and among them, 3 are endemic to Indonesia: Knobbed hornbill (Rhyticeros cassidix), Sulawesi hornbill (Rhabdotorrhinus exarhatus), and julang sumba Sumba hornbill (Rhyticeros everetti). In Java Island, there are 3 species: Wreathed hornbill (Rhyticeros undulatus), Rhinoceros hornbill (Buceros rhinoceros), Oriental pied-hornbill (Anthracoceros albirostris). Other species include are Bushy-crested hornbill (Anorrhinus galeritus), White-crowned hornbill (Berenicornis comatus), Sunda wrinkled hornbill (Rhabdotorrhinus corrugatus), black hornblill (Anthracoceros malayanus), Helmeted hornbill (Rhinoplax vigil), Great hornbill (Buceros bicornis) and Papuan hornbill (Rhyticeros plicatus). The Bucerotinae have a very unique way of nesting. The female hornbills that incubate the eggs will close the entrance of the nest with a wall made of mud with one narrow hole for the male to transfer the food and throw away droppings. Afterwards, the females will shed their feathers to warm the eggs. The shedding of feathers is called moulting and some species moult during the initial stage of incubation. The feathers will grow back when the break out the nest. When the eggs hatch, the females break the cover of the nest and close it again until the chicks are ready to fly. Besides the unique nesting, hornbills are picky to find the trees to nest. Usually, hornbills will choose trees more than 40 cm in diameter and look for holes that are 20-50 meters above the ground. However, there are several species that have special requirements for nesting. The helmeted hornbills need large branch near the nest hole, as a platform when transferring the food into the nest. Hornbills have a close relationship with the noble culture of Indonesian society. 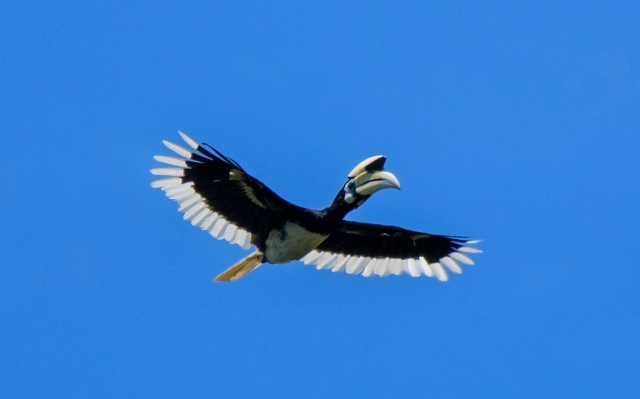 In Kalimantan, Dayak tribe consider hornbills as a symbol of purity, power, and strength. 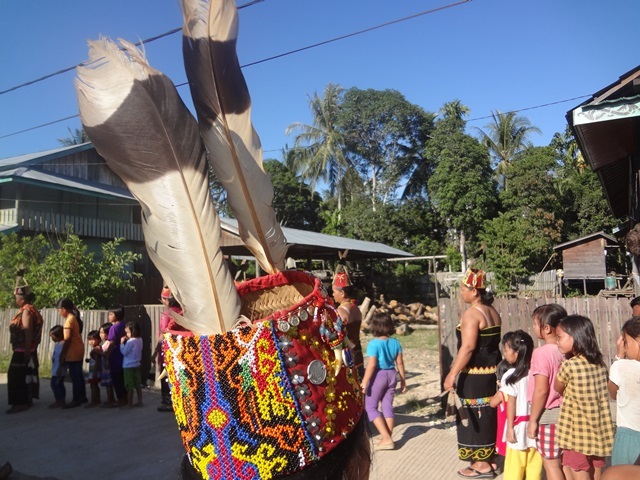 For example, they use hornbill feathers as many acceccories in the traditional dance costumes. The tribe often communicate with their ancestors through the mediation of hornbills. The Dayak community believe that the natural spirits protect the island of Kalimantan and often manifest themselves in the form of a giant hornbill known as the Bird Commander. 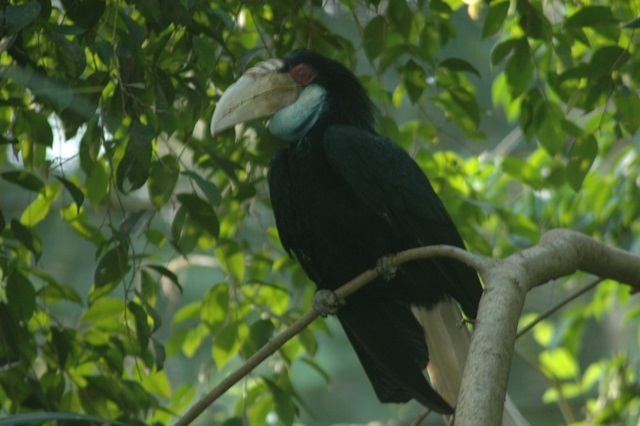 Interactions between humans and hornbills also happened in Java Island. The discovery of hornbill sculpture in Prambanan Temple in Central Java also proves that hornbills have a distinctive position in the traditional societies. 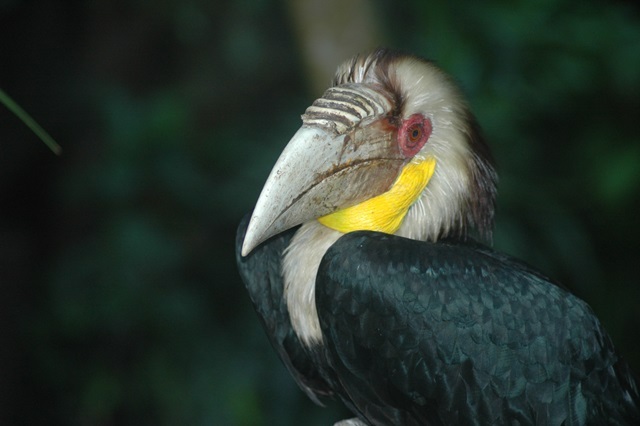 The existence of hornbills in the nature is closely related to the forest conservation. Cruising almost 100 kilometer squares, hornbills are effective seed dispersers in the forest. The seeds are spread through their food scraps or droppings because the hornbill's digestive system does not damage the fruit seeds. 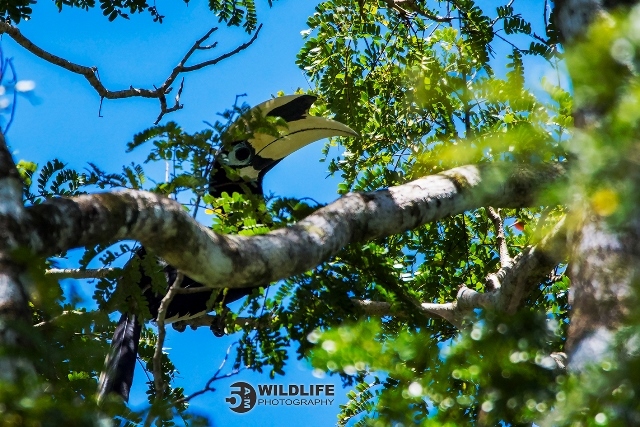 The presence of hornbills in the forest will reflect the condition of the forests that are still healthy and indicate that there are still large trees in the area. This is because hornbills require a variety of fruit trees as feeding and large trees with holes for nesting. This way, the large trees indicate that the forests are in good condition. In other words, protecting the hornbills in the wild means protecting the forest. Unfortunately, the unique and distinct characteristics of the hornbills can lead to disaster. The high illegal hunting, trade, and habitat loss cause negative impacts on the conservation of the large beaked birds. Despite the Minister of Environment and Forestry Regulation No.106 of 2018 (P106), all species of hornbills in Indonesia are protected and threatened by extinction. Many cases of wildlife poachers who hunt for the unique birds are only to show off on social media. For example, on 15 August 2018, there was a viral Facebook post by a man in Poso District, Central Sulawesi. The perpetrator was holding two hornbills in the photo. 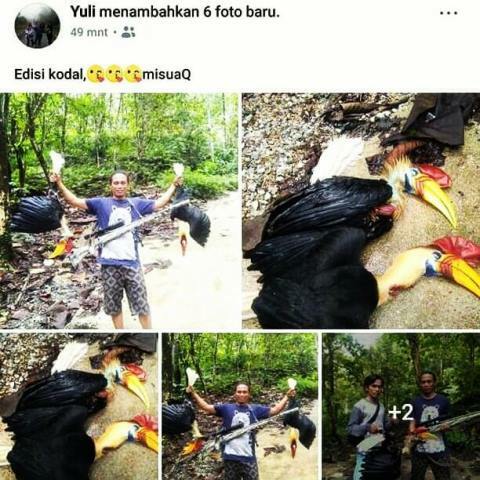 The latest, on 11 January 2019, a post on Facebook by resident of Lebak Regency, Banten showing hornbill as a hunting catch. Luckily, the authorities arrested the culprit in the following two days. Apart from hunting for hobbies and show-off, the beauty of hornbills attracts the bird collectors. This leads to illegal hunters and traders of wild animals to hunt the species. For example, on 14 June 2015, the Provincial Board of Leuser Mountain National Park, succeeded to catch in the act two seller of hornbill beaks. The perpetrators were arrested when they were about to sell 12 beaks of hornbills poached from the forest. The criminals admitted that the 12 beaks will be sold to a number of countries like China, Malaysia, Singapore and Thailand, through other black market networks.They got the illegal beaks from Blang Kejaren, Aceh. At least, more than 10 black market networks who poach the birds in the forest or look for the birds in the locals who happen to run into or find the live birds in the forests. The beaks were about to be smuggled to Jakarta for overseas trafficking. They said that there have been more than 100 beaks had been sold. Other case on 13 December 2018, Southeast Aceh Police arrested 4 illegal traffickers of helmeted hornbills and deer antlers in Deleng Pokhisen District, Southeast Aceh Regency. 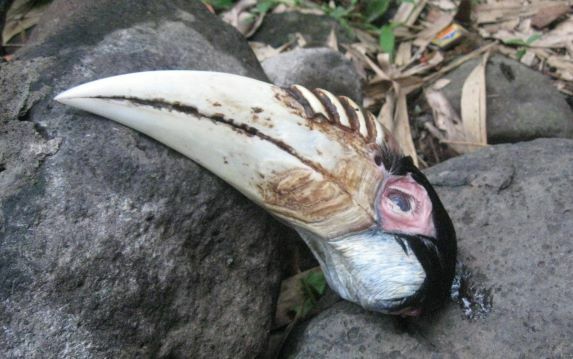 During the arest, the officers found 16 parts of helmeted hornbill (Rhinoplax vigil). The involvement of the illegal wildlife trade network will further put the threatened hornbills in the wild with extinction. Despite being protected by the law, illegal hunting and trade of hornbills are in fact still continuing. 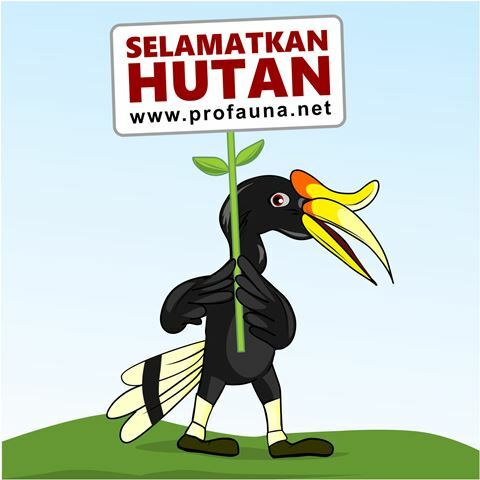 PROFAUNA Indonesia since 2018 has put more serious attention to the conservation of hornbills and their habitats. Hornbill serves as an icon of PROFAUNA's campaign regarding forest conservation in Java Island, one of which is located in the southern Malang region. For further information regarding the programme in southern Malang, please check here: Lowland Forest Conservation. Let us leave hornbills to live freely in the wild so that the birds can carry out their function as seed dispersers in the forests. By protecting the hornbills, forests will be conserved and the local communities will still be able to use the forest sustainably.